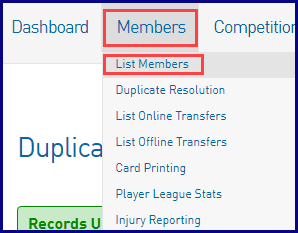 When a member has more than one record, they should be marked as duplicates and merged into one. It is now possible to see who merged the records and when. Hover over Members and select List Members. Find the member's record and click on the magnifying glass to open it. NOTE: you can also use the Advanced Search to find the member. Click on the cog in the right corner and select Audit Log. The audit log will show you the details of the duplicate merge including who did the merge.